Due to meet for the third time in about 18 months, Democratic Republic of Congo (DRC) and Cameroon will be facing off in Lubumbashi this Saturday, as the African Cup of Nations qualifying kicks off in what could probably be deemed the “group of death”. Joined in the group by Cote d’Ivoire and Sierra Leone, points will be worth double in this group, as these two sides wish to cast away accusations of slipping standards and elevate themselves to potential contenders once more. Meeting each other in the group stage of qualification for a major tournament once again, their World Cup qualification campaign saw them bore each other into submission with a 0-0 draw and a 1-0 Cameroon win, as the Indomitable Lions emerged above an impressive Libya largely via the administrative blunder from the Togolese FA which saw them awarded a 3-0 victory. Whilst you might think that almost any other African team could have made a better job of the World Cup than Cameroon did in Brazil, DRC’s recent results means that they’re one of the few teams that may have in fact done worse. Despite being one of the largest countries on the continent and one of the strongest domestic leagues in Africa as well, DRC has largely failed to live up to the potential that its players possess in recent years, with a disappointing 1st round crash out at 2013 AFCON and just a single win in six during World Cup qualifying creating a negative aurora around the team. With Jean-Santos Muntublia acting as a caretaker manager for the past year, in what was his fourth stint in such as role, they have given the reigns to a new man for this campaign. Having reached the quarterfinals of the African Nations Championship under Muntublia, the decision was made a couple of weeks ago to give the job to the Congolese Florent Ibenge, who previously managed local giants AS Vita. Having taken them to the semi-final of the Champions League, he takes over from Claude Le Roy before Muntublia, as, after failing to reach the World Cup, the French warhorse left his duties to manage neighbours Congo – as he continues his seemingly endless tour of short, unsuccessful stints in charge of African countries. Having not announced a squad for the game at the time of writing, it is difficult to assess the chances of beating the Cameroonians, but injuries permitting it is reasonable to assume a certain number of stalwarts in the squad. From Europe, Dieurmerci Mbokani will no doubt appreciate the opportunity to get out of Ukraine, whilst Youssef Mulumbu and Cedric Makiadi will be typically combative in the centre of midfield. The domestic game in Africa will also no doubt be well-represented, with the possibility of Deo Kanda and Tresor Mputu being involved, as well as Patou Ebunga-Simbi’s role at AS Vita potentially playing a role in him staying at centre-back under Ibenge’s reign. 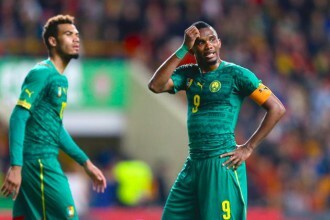 Cameroon, meanwhile, have been very much ringing the changes, in one of the biggest overhauls in recent times for the country, as Volker Finke aims to move on from the World Cup travesty with a general mantra of picking players who are playing football for their clubs. All three of the goalkeepers have changed from the World Cup, as no.1 Charles Itandje is left out alongside Sammy N’Djock and Loic Fedjou, with Guy Roland Ndy Assembe presumably taking the first choice gloves ahead of Tonerre Yaounde’s Pierre Sylvain Abogo and the young Barcelona keeper Joseph Ondoua. The backline is also full of new faces, as Macky Bagnack looks to be in-line to be involved alongside Jerome Guiahota of Valenciennes and Ambroise Oyongo of New York Red Bulls, with Benoit Assou-Ekotto and Danny Nounkeu amongst the names that miss out. Gaetan Bong and, Raoul Loe and Georges Mandjeck are back into the squad, with World Cup standby Guy Christian Zock and Marc Kibong Mbamba possibly due to make their debuts, as Jean Makoun and the suspended Alex Song are not included. Edgar Salli is involved in the squad, with the possibility of him taking up an advanced central role in an attempt to foster some creativity in this team. In attack, Clinton Njie has been included after breaking into the Lyon squad, as well as Swiss-based Franck Etoundi (brother of Stephane Mbia), Leonard Kweuke and World Cup standby Jean-Marie Dongou. With only 9 of the World Cup squad remaining, leadership also took some hits ahead of the games against DRC, as Stephane Mbia was elected new captain instead of the outgoing Samuel Eto’o, with Vincent Aboubakar and Eric Choupo-Moting named vice-captains. The resulting retirement of Eto’o from international duty makes this an intriguing match for Cameroon. With the so-called “Eto’o era” now apparently over, how the squad reacts to these changes could be a signal of how the post-Eto’o will work out, with a loss against DRC undoubtedly resulting in calls for their all-time top scorer’s return. With a host of new faces involved as the team steps into uncharted territory, this could well be an opportunity for the Congolese to pounce on the Indomitable Lions, and earn some well-needed points if they are to qualify for Morocco 2015. With both teams looking at Ivory Coast as the side likely to romp through this group, both will be particularly keen to some points from this game, with the 2nd place spot likely to be the realistic target for both teams. How this will work out is debateable. Whilst it could spring a spree of goals and attacking football, the penchant that either side has for goals and creativity suggests this one may turn out to be a dreary draw, as both sides will almost certainly be content with a point considering their respective situations.